Nigeria’s Super Eagles on Tuesday defeated the Pharaohs of Egypt 1-0 in international friendly match played at the Stephen Keshi Stadium Asaba, the capital of Delta State. Nigeria took the lead barely one minute into the match through Paul Onuachu who took a blasting short from outside the 18-yard box that beat the Egyptian goalkeeper. The Super Eagles dominated the game in the first half of the match, but failed to score another goal as they wasted a few goal scoring chances they created. In the second half, the Egyptians lifted their game and created a few chances in their bid to get the equalizer, but the excellent goalkeeping of substitute goalkeeper Ikechukwu Ezenwa frustrated their efforts. The Super Eagles also made some impressive moves at increasing the tally, but again failed to convert any of the chances created. Despite the lone goal score line, the game was keenly contested by the two sides and the fans applauded the skillful displays of the players. Nigeria and Egypt have booked their places in the African Cup of Nations tournament which kicks off in Egypt in June. 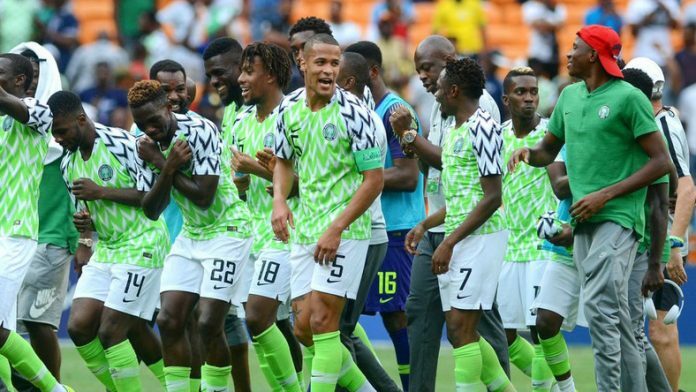 The international friendly was part of the preparations lined up by the Nigerian Football Federation for the Nigerian team ahead of the tournament.